Traktor now allows inline editing for tracks even from the node Explorer. 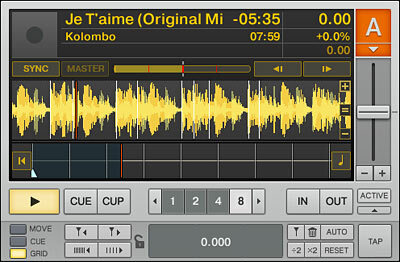 In earlier versions inline editing was only possible for tracks that were imported into the Track Collection. As long as the track is not loaded into a deck, inline editing from the Explorer node works fine. However, do not use inline editing from inside the Explorer node when the track is loaded into a deck. Especially, do not use it during a gig when the track is currently playing and audible to your audience. When the track is loaded and you press Enter after changes are made, your deck will look as shown. The stripe disappears, the beatmarker is gone, the BPM value is set to 0.000, and the Sync button is switched off. You will need to re-analyse and re-beatgrid the track to get the information back. One of the new features in version 1.2.1 is the ability to change and correct the Autogain value, that Traktor detected during track analysis. The Autogain value can be changed in the Edit dialog.This works fine as long as you edit one track at a time only. However, if you select several tracks, open the Edit dialog (maybe for changing comments ar ratings for several tracks at the same time), and click OK, the Autogain value of all selected tracks is overwritten with 0.0. You need to re-analyse the tracks to get the detected Autogain value back. Note: This information is based on Traktor version 1.2.1.7692. Impressum - Legal Notice | Press Area | Copyright © 2008-2016 Haselier IT Services. All Rights Reserved.